Brown County is located in the south central part of Minnesota, approximately 100 miles southwest of the Twin Cities. 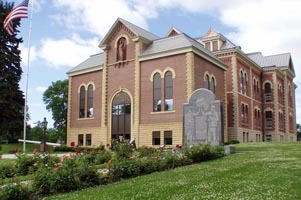 Brown County has a population of 25,893 with New Ulm as the largest city and county seat. The county is mostly agricultural, but also has many industrial and commercial businesses. Brown County was officially organized by the U.S. Territorial Legislature on February 18, 1856 and is named after territorial councilor Joseph Renshaw Brown. The earliest pioneers included Germans, Norwegians, English, Irish, Luxembourgers, and Danes. Brown County is very proud of its historic roots and you will find history celebrated wherever you go. Brown County has much to offer for recreation, community events, and business opportunities. Enjoy camping in Flandrau State Park and Lake Hanska County Park, canoeing down the Minnesota and Cottonwood Rivers, visit historic Schell’s Brewery in New Ulm, attend some of the many community festivals including the Syttende Mai celebration (Norwegian Constitution Day) in Hanska, or check out some local history at the Brown County Historical Society Museum in New Ulm or the Depot Museum in Sleepy Eye. Whether you are here to work or play, Brown County is the place to be!